The Maxwell will celebrate the exhibitionss Last Supper by C. Maxx Stevens and Ecologies of Resistance by DesertArt LAB. C. Maxx Stevens will attend celebration and present a gallery talk about Last Supper at 6pm, followed by a reception for both exhibitions. Last Supper by C.Maxx Stevens, Seminole/Mvskoke, is a conceptual installation pointing to the negative effect of contemporary diets, and the devastating effect of diabetes throughout native nations. C.Maxx Stevens is an Installation artist and Seminole/Mvskoke Nation from the Oklahoma Region. Her art is based on memories of family and culture expressed in three dimensional environments using materials, objects, and technology to build a visual narrative. She is currently an Assistant Professor of Art at the University of Colorado in Boulder, Colorado serving as the Foundation Arts Director in the Art and Art History Department. 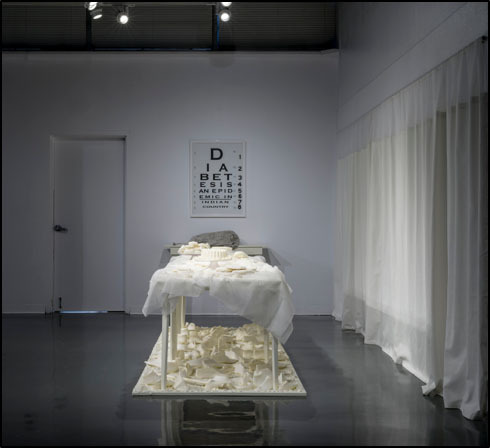 Ecologies of Resistance illustrates the artistic process of the DesertArt LAB collaborative’s site-specific ecological installation in the high desert of southern Colorado, through the use of artifacts, archival materials, and botanical samples. April Bojorquez has worked in the museum field nationally/internationally as an educator, curator, and researcher. She is based in San Francisco and Southern Colorado. Bojorquez is fellow of the Smithsonian Institution’s Latino Museum Studies Program. Matt Garcia’s artistic practice investigates ecology, its relationship to knowledge systems and how media can connect communities to a reclaiming or re-imagining of lost epistemology. Garcia is currently an assistant professor of Art and Design at Dominican University of California. Garcia was formerly an assistant professor of Digital/Experimental Media in the Department of Art at Kansas State University.